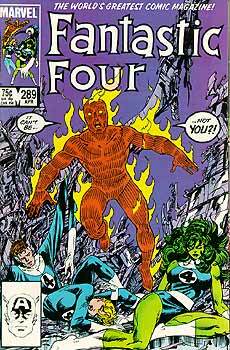 Many artists have drawn the Human Torch over the years. 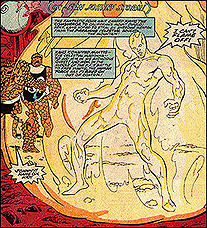 While nearly every character Jack Kirby designed has undergone various "transformations" (beyond simple costume designs) at the hands of different artists, the Human Torch has almost always been depicted the same way. But occasionally Johnny does undergo a treatment to alter his flaming form, and this document will explain why this can be legitimized beyond a standard "artist's interpretation" clause. First, we need a quick analysis of Johnny's flame power. Although he is often believed to become a sort of living fire, his physical form does not alter in any way. Johnny does in fact surround his body with a red-hot plasma that gives him the appearance of being on fire. This plasma is of course what gives him his famous red hue when he is flamed on. (If he did become entirely composed of fire, he would have no physical form to be able to carry objects nor would any physical attack ever harm him.) It stands to reason that Johnny can control the depth of this plasma sheath at will in connection with his temperature, thus altering his appearance when flamed on. 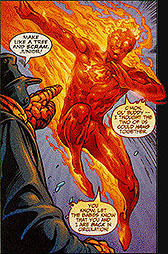 Below are several interpretations of the Human Torch. You can easily see the progression of detail in each drawing as Johnny's plasma covering becomes thinner and thinner. As you can see in this first image, Johnny is at his highest intensity. In fact, this particular image portrays Johnny at a level even higher than his normal nova blasts, as he had recently underwent changes during the Inferno story arc. His plasma layer would here be at it's thickest, and nearly all of the details of his form are hidden beneath his firey sheath. Normally this depletes all of Johnny's energy, causing him to immediately flame off; therefore, he is generally only seen this way for brief periods of time. 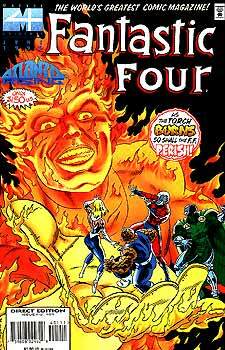 Shortly before this panel, Johnny had accidentally burned the mutant Storm. He was understandably upset with himself and raced through rigorous training exercises, attempting to further hone his abilities. His powers would most likely be at their normal upper limit under these circumstances. You can see his musculature and basic form beneath the flames, but the details of his costume are still obscured. Here, Johnny is at his normal power level. Some of the more signifcant details of his costume (gloves, boots, etc.) are seen, but anything less noticable is still hidden. Johnny claims to be at nearly 800 degrees Farenheit at this level. By reducing the depth of his plasma covering even more, Johnny and his costume are almost completely discernible. You can easily see the "4" logo on his chest, but minutia such as his belt buckle are still somewhat obscured. Although this image does not take place within the context of the story itself, but there is no reason why Johnny could not reduce his plasma sheath to such a thin layer that even the seams on his gloves are easily distinguishable. I believe these design differences were unintentional. It seems to me very doubtful that many artists took the time to think much about the transparency of Johnny's plasma coating. Marvel has yet to officially explain these differences, but I think my explanation holds a great deal of merit. A combination of oversights and artistic license have evolved into a plausible theory about a minor aspect of the Human Torch's power and perhaps one day I will be able to incorporate my ideas into the Marvel Universe.